Interested in a Career with Tex Visions? Tex Visions is a leading manufacturer of display hardware and custom large format printing. Our commitment to innovation, quality, and superior customer service has played a large part in the growth and success of our company. At Tex Visions, we are continuously growing our business and adding to our teams. We are looking for team members who take pride in their work and achievements, and who see a challenge as an opportunity. We invite you to learn more about our company and to apply for employment at Tex Visions. 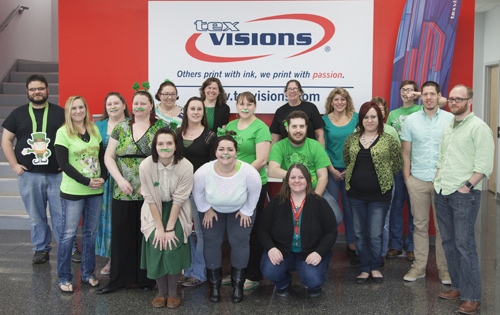 Tex Visions is an Equal Opportunity Employer and is proud to have a drug-free environment. All employment offers are contingent upon applicant successfully completing drug and background screenings. Can you provide proof of your eligibility? Are you available to work evenings or weekends if necessary based on position? Are you a former Tex Visions employee? After reviewing the job description, please indicate if you are able to perform the essential functions of the job for which you have applied? Have you ever been convicted of a crime which is substantially related to the functions or qualifications of the job for which you are applying? Please use this space to elaborate on any background, experience or qualifications you believe should be considered in evaluating your qualifications for employment. You may include hobbies, volunteer experience and any other activities you believe relevant. *Please omit any information that would disclose your race, gender, age, marital status, ethnic origin, religious or political affiliations, or disability. In exchange for the consideration of my job application by Tex Visions LLC, (hereinafter called “the Company”), I agree that: Neither the acceptance of this application nor the subsequent entry into any type of employment relationship, either in the position applied for or any other position, and regardless of the contents of employee handbooks, personnel manuals, benefit plans, policy statements and the like as they may exist from time to time, or other Company practices, shall serve to create an actual or implied contract of employment, or to confer any right to remain an employee of Tex Visions LLC, or otherwise to change in any respect the employment-at-will relationship between it and the undersigned, and that relationship cannot be altered except by a written instrument signed by the Owner/Managing Member of the Company. Both the undersigned and Tex Visions LLC may end the employment relationship at any time, without specified notice or reason. If employed, I understand that the Company may unilaterally change or revise any or all benefits, policies and procedures at any time and such changes may include reduction in benefits. I authorize investigation of all statements contained in this application. I understand that the misrepresentation or omission of facts called for is cause for dismissal at any time without any previous notice. I hereby give the Company permission to contact schools, all previous employers (unless otherwise indicated), references and others and hereby release the Company from any liability as a result of such contact. I understand that, in connection with the routine processing of your employment application, the Company may request from a consumer reporting agency an investigative consumer report including information as to my credit records, character, general reputation, personal characteristics and mode of living. Upon written request from me, the Company, will provide me with additional information concerning the nature and scope of any such report requested by it, as required by the Fair Credit Reporting Act. I understand that if a job offer is made, a pre-employment drug screen will be conducted. This drug screen is paid for by Tex Visions. I further understand that my employment with the Company shall be probationary for a period of ninety (90) days and further that at any time during the probationary period or thereafter, my employment relationship with the Company is terminable at-will, at any time, for any reason, by either party. Tex Visions LLC is an equal employment opportunity employer. We adhere to a policy of making employment decisions without regard to race, color, religion, gender, sexual orientation, national origin, citizenship, age, or disability. We assure you that your opportunity for employment with Tex Visions LLC depends solely on your qualifications. Thank you for completing this application form and for your interest in our business.